Love the patio set. It really looks nice on my porch. We sit out every evening and early morning. I would definitely recommend this merchandise to all my friends. This user was entered into a sweepstakes after submitting their honest review. 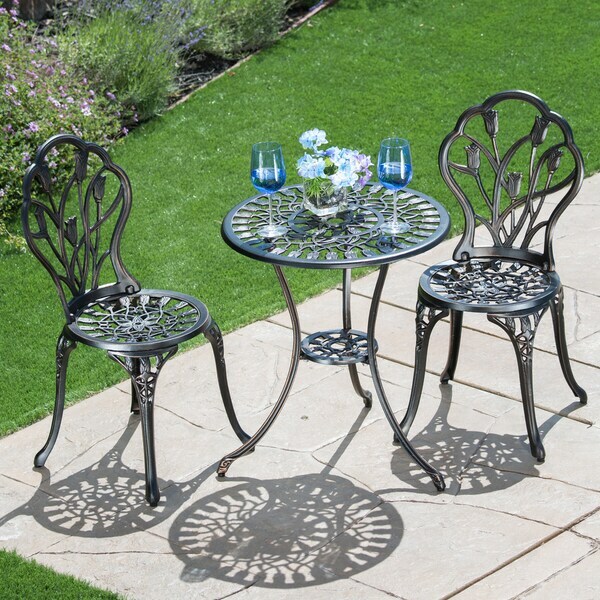 Decor your outdoor areas with this outdoor 3-piece bistro set by Corvus. The cast aluminum construction ensures long-lasting durability even when exposed to the elements, and the rich bronze finish and ornate pattern go well with any kinds of patio style. Chair Dimensions / Weight (each): 35.4 inches high x 18.5 inches wide x 16.1 inches deep / 10.2 lbs. Table Dimensions / Weight : 26.7 inches high x 23.6 inches in diameter / 10.4 lbs. Love the patio set. It really looks nice on my porch. We sit out every evening and early morning. I would definitely recommend this merchandise to all my friends. I understand the terminology "Assembly Required". However, it is customary to include the instructions for said assembly. I love my bistro set. I came right on time and it was exactly as described. Easy to put together with not issues. This was a gift and I know the person who received it loves it and uses it on her porch frequently.. Good quality, wears well.